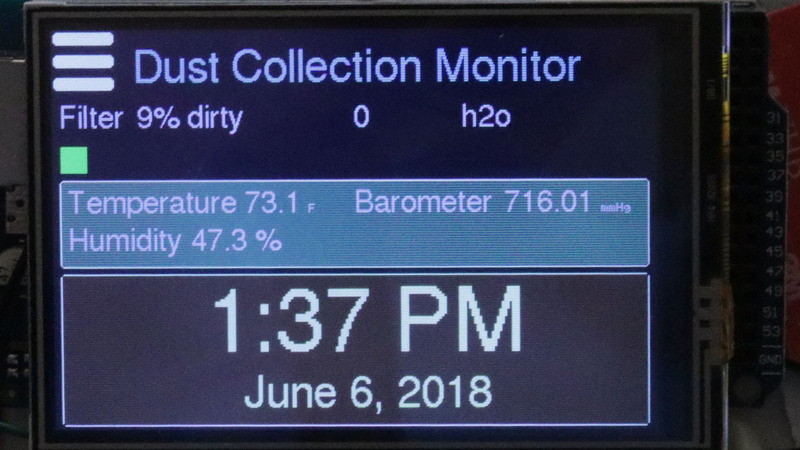 This dust collection monitor is an Arduino project to allow you to see when it is time to clean the cartridge filter of your dust collector, as pressure builds up inside the more it gets clogged with sawdust. You will buy all the parts, this purchase gets you the schematic and the software to run it. Beta: This software is currently in beta testing. It is working great for me, but there may be bugs. Let me know, and I will fix the bugs very quickly and get out a new release. I’ll remove this message once it seems stable for people. If you missed my article with all the details of this product goto the DC Monitor page. 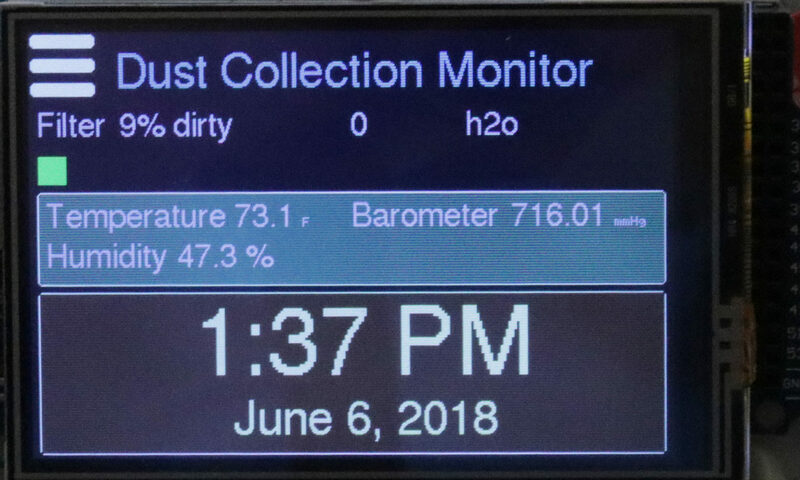 Purchasing this product gives you the Arduino schematic and the software needed to create your own Dust Collection Monitor (no hardware, this is just for a download of software, schematics, and access to the detailed build article). 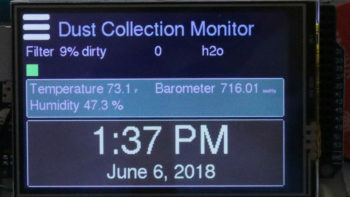 This monitors the pressure build up in your dust collection cartridge filter, the higher it gets, the dirtier your filter is and needs cleaning. The idea is to let you know when to clean the filter, before it is too clogged and not working. It also shows the date and time, temperature, humidity and barometric pressure. Tracks hours of run-time per cleaned filter, for the filter since it was new, and for the entire dust collection system. This product allows you to choose the units you would like to display the temperature in (F/C) and units for the cartridge filter and vacuum pressure, as well as units for the barometric pressure. I will include updates to the software for one year. I will be fixing any bugs and possibly adding on new features or ideas. I’ve tried to also add code to help you in case of issues. If your screen is working, it will display issues with any of the I2C devices (temp module, analog reader, or any optional clock module). NOTE: You will need to know how to solder. A lot of the Arduino modules come without the header pins attached, because of different ways to do things, you might solder on something different, so they leave it off. You won’t need to know how to program, but you will need to load the Arduino API and setup libraries, and insert my software and compile and load it to the Arduino. This is a do it yourself project – only the software and schematic are provided. Right now this is in English only. It is possible if enough interest is shown, I may add other languages (especially if you can help translate the phrases). To best be able to get updates, I’d rather you let me know about bugs or ideas you have for new features (rather than fix it in your own copy of the software), if I can keep the software up to date, it allows you to easily get the newest update from me in the future.